The walk to the summit is usually from the road at Astley's Plantation car park, itself at over 200 metres above sea level, and only 700 metres from the summit. Although short and easy by most standards, and popular with families, it has many of the characteristics of a walk in the higher Lakeland fells, with some (short) steep slopes, rocks to negotiate, and rowan, bracken and heather. The lower slopes are forested, but the upper portion is moorland. Gummer's How is the subject of a chapter of Wainwright's book The Outlying Fells of Lakeland. He describes it as "an old man's mountain", and says of it: "And when ancient legs can no longer climb it know ye that the sad day has come to hung up the boots for ever and take to slippers". 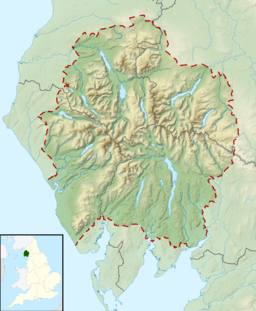 Simon Jenkins rates the Windermere panorama of the Lake District, Pennines and Morecambe Bay as one of the top ten in England. ^ Wainwright, A. (1974). "Gummer's How". The Outlying Fells of Lakeland. Kendal: Westmorland Gazette. pp. 44–47. Wikimedia Commons has media related to Gummer's How. This page was last edited on 5 April 2018, at 22:59 (UTC).